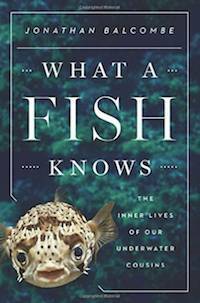 What a Fish Knows draws on the latest science to present a fresh look at these remarkable creatures in all their breathtaking diversity and beauty. Fishes conduct elaborate courtship rituals and develop lifelong bonds with shoalmates. They also plan, hunt cooperatively, use tools, curry favor, deceive one another, and punish wrongdoers. We may imagine that fishes lead simple, fleeting lives―a mode of existence that boils down to a place on the food chain, rote spawning, and lots of aimless swimming. But, as author Jonathan Balcombe demonstrates, the truth is far richer and more complex, worthy of the grandest social novel. For more, visit Jonathan's website.